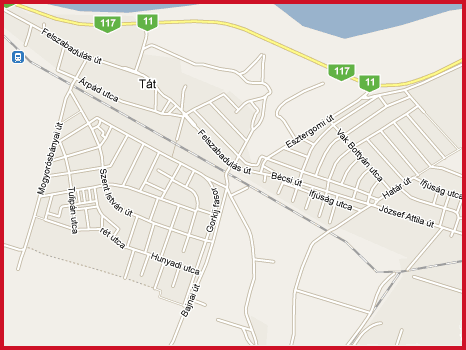 Geographical Coordinates: Latitude 47° 44' 26"
Tát is a village in Komárom-Esztergom county, Hungary. 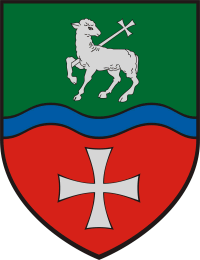 The coat of arms represents a shield erect with sloping sides and a pointed base, at fess point divided by a bar wavy azure symbolising the Danube. The upper field bears: vert, a Paschal lamb argent headed reversed, the eyes fixed on the cross, holding the lower limb of the cross with the dexter foreleg. The lower field bears: gules, a Maltese cross argent. The history of the settlement got recorded in ancient, Roman and Árpádian-age documents. The Roman road leading to Acquincum (Óbuda) diverged at Tát, one branch in the direction of Esztergom, the other toward Dorog. Despite the fact that recent research has identified the first written mention of the name Tát as having been made very early (exemplified by the date 1146, when a hospes called Fulkó bestowed his property at Tát on the Abbey of Pannonhalma), the inhabitants of Tát consider 1181 as the year of birth of their settlement. It was then that King Béla III, one of Hungary's Árpádian-age monarchs, gave the village of 'Taath' to the Order of the Knights of St John, whose successors are the Knights of Malta and the Knights Hospitalers. The place of worship to be found on the site of the present-day church was recorded by some contemporary chronicles as a hospice. Later the bishop of Veszprém wanted to obtain the area from the knights, and Pope Boniface VIII himself acted as a judge in the case. In 1356 Archbishop Nicholas registered the land properties. Under King Sigismund the possession of the order was obtained by secular priests, then it was to be owned by the Chapter of Esztergom. From the 1500s the settlement was declining, yet in the Turkish tax register of 1570 ten houses were recorded. The last famous battle with the Turks in Esztergom County took place at Tát in 1685, whereby the army of Prince Charles of Lorraine fought the 100,000 Turkish soldiers of Ibrahim Saitan. Following the overwhelming victory of the Christian army, by the end of the 17th century Tát already gave home to 17 serf families. Between 1710 and 1740 the scarce population of the village grew with several waves of hardworking and skilful German, Austrian and Swabian settlers. The settlement, today a municipality, is located by the Kis-Duna (a branch of the Danube), embraced in the north by the branches of the ancient river and surrounded in the south by the Gerecse Hills. 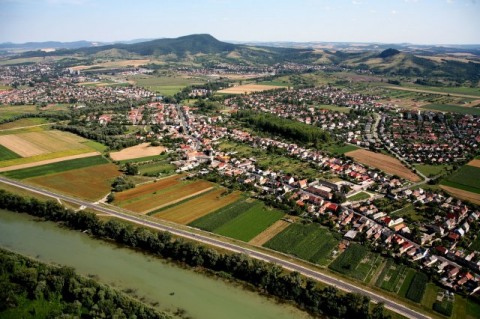 It is to be found by trunk road 10, earlier considered as the main route between Buda and Vienna, at a distance of 8 kms from Esztergom, the one-time capital of Hungary and also called the Hungarian Vatican, and at a distance of 45 kms from Budapest, the present-day capital.